Alex Salmond has made an impassioned plea to Europeans to back Scotland’s cause ahead of Brexit. 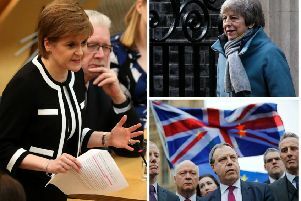 The former First Minister was in Brussels yesterday for talks with European Commission chief Jean-Claude Juncker, where he again called for Scotland to stay in the European Union (EU). Mr Salmond’s trip to Brussels comes ahead of the Scottish Government’s publication of proposals for keeping Scotland in the single market after Brexit. In a speech, Mr Salmond said: “We have no intention of allowing our 1,000-year history as a European nation to be severed by the failures of the Westminster political establishment. Mr Juncker also repeated his comments from June, saying that Scotland had ‘earned the right to be heard’. Scottish Secretary David Mundell said yesterday that he was open to a ‘differential arrangement’ for Scotland in negotiations for leaving the EU if it was supported by evidence, but stressed that there could not be a separate deal for Scotland. The SNP’s proposals for maintaining Scotland’s ties with the EU are due to be published next week, and Mr Mundell said that he hoped the plans would be ‘workable’ and ‘credible’ and able to be incorporated into the negotiations.